Team Group introduced the Xtreem S2, a new series of SATA 6Gbps solid state disk. Available in 60GB, 120GB and 240GB capacities, these disks offer read speeds of up to 550MB/s and a write speed of 480MB/s, 500MB/s and 520MB/s, respectively. Maximum random 4k write performance is 50,000 IOPS. Team Group Inc. officially announced the Xtreem SSD family’s second SATA3 super high-speed solid state drive – Xtreem S2. 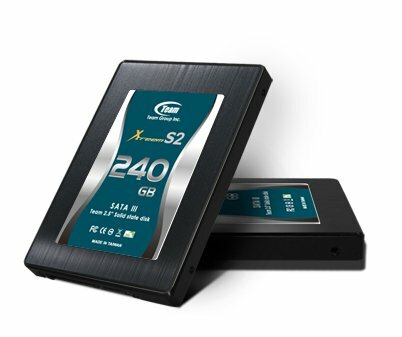 In addition to the outstanding performance and energy-saving abilities, the Xtreem S2 SSD features customized product positioning and market strategy in accordance with the need of mainstream enthusiasts, allowing enthusiasts to enjoy the speedy pleasure of extreme performance at an economical price. In consideration of the rapidly growing need for performance-oriented SSD on the mainstream market, Team Group roll out Team Xtreem S2, offering high quality at preferential price, based on on the mission of SSD promotion, and the core product concept of high cost-performance ratio. Team Xtreem S2 achieves max read speed of 550MB/s and max write speed of 520MB/s With high performance and a more competitive price which compared to other SSD products on the market, Team Group show their determination to introduce its high-speed SATA3 device to all power users. In addition to inherit the Xtreem family’s excellent tradition of high speed and high stability, Team Xtreem S2 also integrated Team Group’s innovation in research and development and four major optimization technologies including TRIM Command, Garbage Collection, DuraWrite and Wear Leveling. It not only has much longer lifespan than other SSD devices, also accomplishes the supreme enthusiast’s ambition. Team Xtreem S2 is definitely the best choice for enthusiasts to DIY computers and upgrade laptops.